This entry was posted on February 12, 2014, in Chocolate dipped strawberries, Uncategorized and tagged champagne, Chocolate dipped strawberries, dipped strawberries, Fannie May Champagne Celebration, Fannie May Champagne Celebration Strawberries. Real Love Deserves Real Chocolatesm! 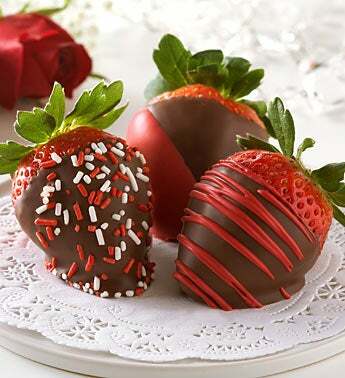 Our strawberries are dipped in delicious 100% Real Dark Chocolate. Say YOU’RE WONDERFUL with this extravagantly decadent gift — 12 lush, ripe strawberries hand-dipped in 100% real dark chocolate then drizzled or decorated to perfection. 4 are dipped in real dark chocolate with sweet red drizzle, 4 are dipped in real dark chocolate with red and white sprinkles, and 4 are diagonally dipped in real dark chocolate and red confection – all with scrumptious results. It’s simply the best chocolate covered strawberry experience they’ll ever have. 12 Strawberries. 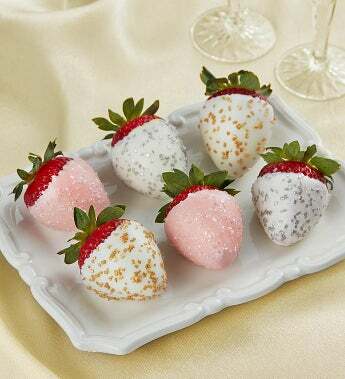 This entry was posted on February 12, 2014, in Chocolate dipped strawberries, Uncategorized and tagged Berry Bliss Strawberries, Chocolate dipped strawberries, dipped strawberries, Fannie May, Fannie May Berry Bliss Strawberries.